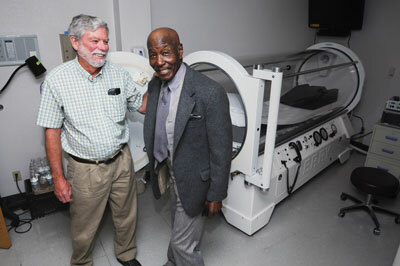 Otis Bass (right) with Vacaville Podiatrist Randy Osborne and the hyperbaric oxygen chamber that helped heal his wound. Otis Bass, 79, of Vacaville, knows all about the disabling complications of diabetes. In 2005, his right leg was amputated, and in 2009, he lost two toes from his left foot. To heal the wound after his toes were removed, Otis was referred to the NorthBay Center for Wound Care to undergo Hyperbaric Oxygen Therapy (HBOT). Breathing 100 percent oxygen under pressure increases the oxygen concentration in all body tissues, even areas with reduced or blocked blood flow, which is often a complication of diabetes. HBOT stimulates the growth of new blood vessels to locations with reduced circulation, and can actually prevent amputations. For Otis, the therapy healed his wound and has helped him avoid further loss of limb. Otis underwent three months of daily, two-hour treatments in a hyberbaric chamber—a glass cylinder designed to hold a single patient and administer oxygen under pressure. While HBOT is considered the best evidence-based practice to treat diabetic wounds, the treatment also helps with other chronic, difficult-to-heal wounds. The NorthBay Center for Wound Care opened on the VacaValley Hospital campus in 2003. The outpatient center specializes in the treatment of chronic and non-healing wounds, using the latest techniques medical science has to offer. The team of medical professionals is able to heal more than 95 percent of the wounds they treat within 14 weeks with careful use of hyperbaric oxygen therapy, wound-cleaning techniques, medicines, dressings, minor procedures and other support services. The center offers the only civilian hyperbaric oxygen chambers in Solano County. In 2010, the center expanded to include an outpatient infusion center that allows patients to receive their IV medications without a hospital visit. Services include PICC insertion and PICC/Central Line dressing changes, IV hydration, IV antibiotics, and IV osteoporosis medications. They also perform blood transfusions and iron- replacement therapy. The center is located in Suite 100 of VacaValley Health Plaza. For further information, please call program manager Karen Harris at (707) 624-7979.